Must we live in a perpetual construction zone? How can the adverse impacts of construction activity be reduced? We are besieged by public megaprojects, massive new developments, and infill and renovations. In many cases, the community is enriched by new infrastructure but some of the residential work leads to a deterioration of our streetscapes and quality of life. Regardless of the end-impact, virtually all construction activity is disruptive and some of it is downright injurious. The time has come to mitigate the excessive impacts of daily – and sometimes nocturnal – construction work. Our neighbourhoods, our residences and our well-being suffer from construction pollution, traffic and various intrusions. Construction pollution comes in many forms: noise, dust, dirt, garbage, vibration, and fouled air and water. 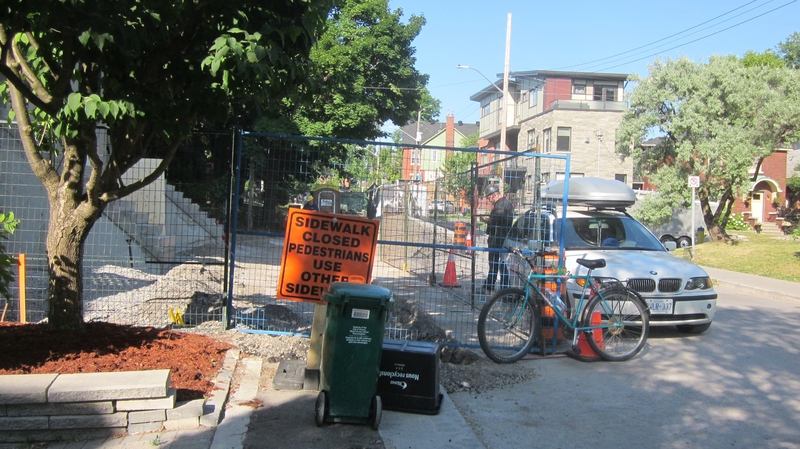 In terms of traffic, construction results in both additional and delayed traffic and a variety of parking woes, not the least of which is construction and workers’ vehicles and storage hogging the parking and often blocking our driveways. And ecologically, construction often damages and kills trees not just on the developed property but also on adjacent properties. And neighbouring residents’ homes develop cracks and suffer other deterioration. In some cases, it’s as though some developers and contractors just don’t care about the negative impacts of the work. And as with an ongoing new house project on Merritt Avenue, a condo on Springhurst Avenue near Simcoe and a demolition on Echo Drive, it seems as though the work goes on forever. So, what’s to be done? First, residents need an enforced “Construction Bill of Rights” to protect them from the ravishes of inconsiderate construction activity. Included in these rights would be provisions that build on existing bylaws like parking restrictions and on new rules such as limits on a project’s duration and a requirement for regular cleaning and tidying of the construction site and the adjacent street and sidewalk. Secondly, neighbours near a construction site need to collaborate and offer a united front against misbehaving developers and contractors. Thirdly, contractors simply need to be respectful of neighbouring residents. Yes, the trades are very important and difficult to manage, but that doesn’t excuse the excessive noise such as running vehicles and beeping horns before 7:00 a.m. Furthermore, before a construction project begins, a clear notice should be posted by the developer or contractor identifying the key contact person and information if there are any questions. And the developer or contractor should consult and talk with residents well before the work begins. The rebuilding of Main Street is a good example of how best to proceed: lots of discussions beforehand, regular updates and a project manager who promptly and thoroughly responded to concerns. So, we likely will live in a construction zone for a long time but let’s work together to make it tolerable. There are many good developers and contractors out there but – with the City’s help – let’s get the excessively disruptive ones to clean up their act.